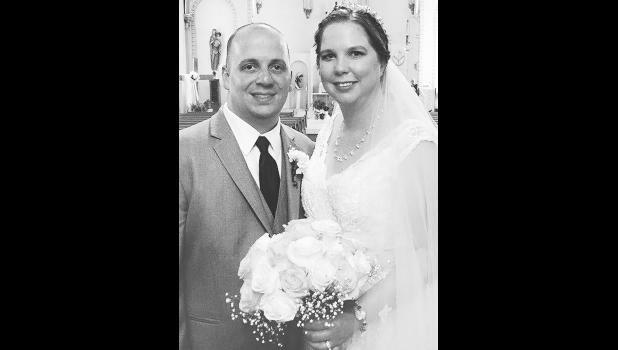 Andrea Renee Schindler and Steven Michael Bunde, both of Holton, were united in marriage at 2 p.m. on Saturday, June 17, 2017, at St. Dominic Catholic Church in Holton. Father Marianand Mendem officiated the ceremony. The bride is the daughter of Andrew Schindler and the late Ramona Schindler. The groom is the son of Robert and Mary Bunde of Lansing, Ill.
Grandparents of the bride are Phil and Deanna Kovar and Beverly Schindler, all of St. Marys, and the late Walter Schindler. Grandparents of the groom are Melvin and Sarah Bunde and Lorraine Przybyl, all of Lansing, Ill., and the late David Przybyl. The bride was given away by her brother-in-law, James Anderson. Her bouquet consisted of yellow and white roses. Matron of honor was Alanna Anderson of St. Marys, sister of the bride. Bridesmaids were April Ronsse and Annette Schindler, both of St. Marys, sisters of the bride. Junior bridesmaids were Kristin Anderson and Kaylee Anderson, both of St. Marys, nieces of the bride. Flower girl was Nicole McDonald of Parker, Colo., cousin of the groom. Serving as best man was Bryan Wilsak of Albuquerque, N.M., friend of the groom. Groomsmen were Erick Bennett III of Chicago, Ill., friend of the groom, and David Bunde of Lansing, Ill., brother of the groom. Junior groomsmen were Lucas Przybyl of Homer Glen, Ill., and Jake Przybyl of Buffalo Grove, Ill., cousins of the groom. Ring bearer was Carter Ronsse of St. Marys, nephew of the bride. A dinner and dance followed the ceremony at Penny’s in Holton. The bride’s cake was made by her aunt, Susan Gordon, of St. Marys. The bride is a graduate of St. Marys High School and Emporia State University, where she earned both a bachelor and master of science degree in elementary education. She is a teacher at Kickapoo Nation School in Powhattan. The groom graduated from Thornton Fractional South High School in Lansing, Ill. He attended the professional pilot program at Kansas State University in Salina. He is employed as a corporate pilot for Vaerus Aviation in Topeka. The wedding rehearsal dinner was held on Friday, June 16, 2017, at The Blind Tiger Restaurant in Topeka. The couple honeymooned in Las Vegas, Nev. They now reside in Holton.